a live play by play twitter feed of the action at the tournament. 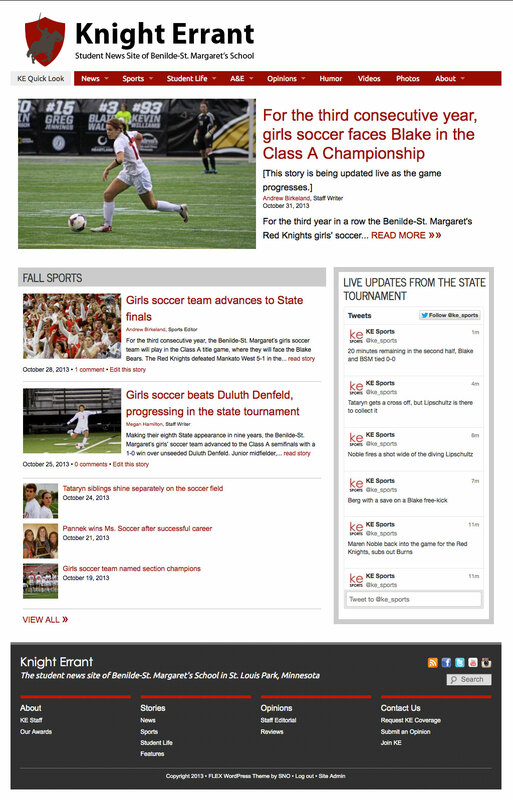 Too often, high school news organizations view their website homepages as static –– they set up a look for the year and then just allow content to work its way through through this page as the year progresses. This thinking is a missed opportunity to use the homepage as a place where the journalism class can create in-depth coverage and use their layout to show readers what is important on any given day. Anyone who happened to visit the Knight Errant on Oct 31 would have no doubt what the most important story in the school community was. With a print edition, where a story is placed on the page signals to the reader that story’s prominence. With the way most WordPress websites are set up, though, there isn’t this natural positioning to let the readers know what’s important. There’s often a showcase carousel at the top of the page for the “big” stories, but that big story gets lost in the rest of the carousel stories, and the rest of the homepage can be a jumble of teasers and thumbnails without there being a clear signal as to what readers should pay attention to next. But this type of attention should be paid to a site on more than just the big story days. Too often on high school news sites, brief and trivial pieces are often given the same treatment as longer, more important stories –– they’re simply ordered by date with the most recent story (rather than the most relevant story) on the top. News staffs should be differentiating the strong and important stories from some of the shorter, more trivial pieces; one way to do this is to use a separate category for the shorter pieces to keep them separate from the longer, more in-depth stories. News staffs should also continually evaluate the placement of categories on their homepage and tailor their design to match the news of the day –– one easy way to do this is to set the category with the strongest content in the most visible and prominent position.